This year’s recipient of the General Tools Award, Robert M. Frame, has contributed to the cause of industrial archeology through research, community service, and projects that have elevated professional and public understanding of industrial property types, as well as for dedicated and sustained service to the SIA. In a long career, Bob has led research, documentation, and preservation efforts on a variety of industrial properties, with a special focus on historic bridges and flour-milling and grain-handling facilities. One of the nation’s leading historic bridge experts, he has completed in-depth studies of truss, concrete arch, and movable bridges, including Minnesota’s first historic bridge survey. He has authored Multiple Property Documents for a variety of bridge types and prepared National Register and Historic American Engineering Record (HAER) documentation for a vast number and wide variety of bridge types. He has assisted in the statewide historic bridge surveys of Wisconsin, Indiana, Nebraska, North Dakota, South Dakota, West Virginia, Louisiana, and Texas. He routinely collaborates with engineers on historic bridge rehabilitation projects to identify bridge preservation solutions that meet functionality and safety needs in addition to complying with the Secretary of the Interior’s Standards. Bob’s interest in historic flour mills and grain elevators dates back to a flour-mill study and survey he completed for the Minnesota Historical Society in the mid-1970s. That project led to his Ph.D. thesis on the history of flour milling in Minnesota (which he is now expanding into a book). It also led him to an issue of the SIA Newsletter, then edited by Robert Vogel, whose lively prose and legendary enthusiasm for IA prompted him to join the cause as an active member. He is the author of several published works on the subject and has presented on the topic at multiple conferences. Bob’s expertise contributed to the establishment of the Mill City Museum in Minneapolis, built in the ruins of the landmark Washburn A Mill, which focuses on the founding and growth of the city in the context of flour milling and other industries that used water power from Saint Anthony Falls. Bob was born and raised in Harrisburg, Pa., where his parents took him to every historic house and site they could find, establishing a lifelong obsession. After high school, Bob enlisted in the U.S. Army, where his service included 18 months in Thailand. Following military service, he went on to receive his B.A. from Shippensburg University, his M.A. and Ph.D. from the University of Minnesota, and a Master’s degree in Public Administration from the Kennedy School of Government at Harvard. After studying at the Institute of Archives Administration at the National Archives, Bob served as an associate curator of the papers of railroad legend James J. Hill in St. Paul. Bob’s past employment has included stints as a private preservation consultant, with the Minnesota Historic Preservation Office, and as executive director of the Preservation Alliance of Minnesota. Since 2004, he has been senior historian with the engineering and architectural firm of Mead & Hunt, where he has worked on several award-winning historic bridge projects. Over the years, Bob has served the SIA in many capacities. He served as a director from 1977 to 1979 and as the editor of the SIA Newsletter from 1983 to 1996. In 1991, he chaired the Norton Prize Committee (since renamed the Vogel Prize Committee), and in 1991 and 1992, he chaired the “Award Development Committee.” That committee originated the General Tools Award and codified it policies and procedures. Bob has authored articles appearing in the Society’s journal, IA; he routinely presents at annual conferences; and he served as program chair for the 1983 SIA Annual Conference in the Twin Cities. Thirty years later, he was actively involved in the planning for this conference and conducted yesterday’s splendid tour of historic bridges on the Mississippi River. In addition to SIA, Bob has been active in numerous other preservation organizations. He has served in a variety of roles for the City of St. Paul Heritage Preservation Commission, the Preservation Alliance of Minnesota, and the Historic Preservation Legislative Task Force for the City of St. Paul. He chaired the City of St. Paul Task Force overseeing the design of the new Wabasha Street Bridge over the Mississippi. In addition to state and local historical societies, Bob is a longtime member of the Society for the Preservation of Old Mills, the Country Grain Elevator Historical Society, the International Molinological Society, and Public Art Saint Paul. In 1996, the Preservation Alliance of Minnesota honored him with its prestigious Honor Award in recognition of his contributions to historic preservation in Minnesota. It is particularly appropriate, as the Society once again gathers in the Twin Cities, that this year’s recipient of the General Tools Award is presented to Bob Frame, here in his adopted hometown. 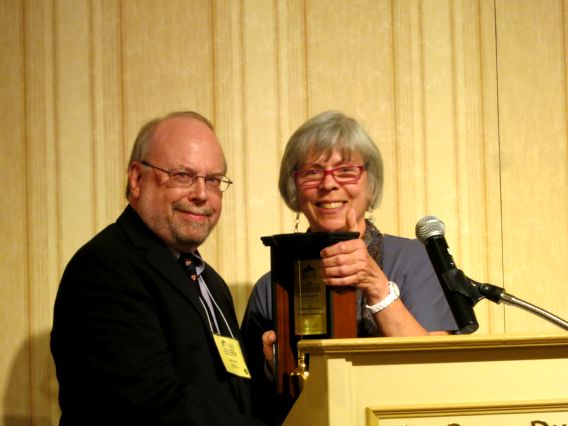 The General Tools Award Committee invites and encourages SIA members to submit nominations for the Society for Industrial Archeology General Tools Award for Distinguished Service to Industrial Archeology. The General Tools Award is the highest honor the SIA can bestow. The award recognizes individuals who have given sustained, distinguished service to the cause of industrial archeology and is presented at the SIA’s annual business meeting. Criteria for selection are as follows: (1) The recipient must have given noteworthy, beyond-the-call-of-duty service, over an extended period, to the cause of industrial archeology. (2) The type of service for which the recipient is recognized is unspecified, but must be for other than academic publication. (3) It is desirable but not required that the recipient be, or previously have been, a member of the SIA. (4) The award may be made only to living individuals. Teams, groups, agencies, firms, or any other collective entities are not eligible. The nomination, which should not exceed three doublespaced typed pages, should address the specific accomplishments that qualify the nominee for the award. Supplementary material (the candidate’s resume, for example) may be appended to the nomination. Nominations must also include the name, address, telephone number(s), and e-mail of the nominator. Any SIA member in good standing may make a nomination. The General Tools Award was established in 1992 through the generosity of Gerald Weinstein [SIA], chairman of the board of General Tools & Instruments Co. LLC, and the Abraham and Lillian Rosenberg Foundation. The Rosenbergs founded General Hardware, the predecessor to General Tools. The award consists of a citation, a commissioned sculpture (“The Plumb Bob”), and a cash award. Previous recipients are Emory Kemp (1993), Robert Vogel (1994), Edward Rutsch (1995), Patrick Malone (1996), Margot Gayle (1997), Helena Wright (1998), Vance Packard (1999), Eric DeLony (2000), Robert Merriam (2001) and Charles Parrott (2002), Alex Barbour (2003), Charlie Hyde (2004), Lance Metz (2005), No award given in 2006, Patrick Martin (2007), Chris Andreae (2008), Carol Poh (2009), Robert Gordon (2010), Richard Anderson (2011), Jane Mork Gibson (2012), Bob Frame (2013).